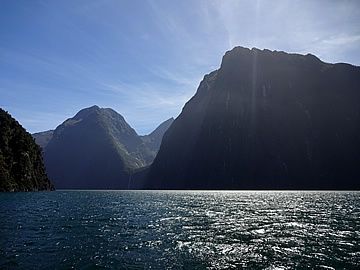 Breathtaking Milford Sound was bathed in glorious sunlight for our boat trip out to the Tasman Sea. 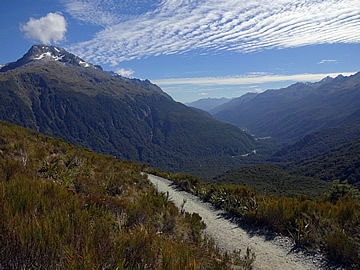 We also spent time exploring the spectacular scenery along the road from Te Anau, including a great tramp to Key Summit. 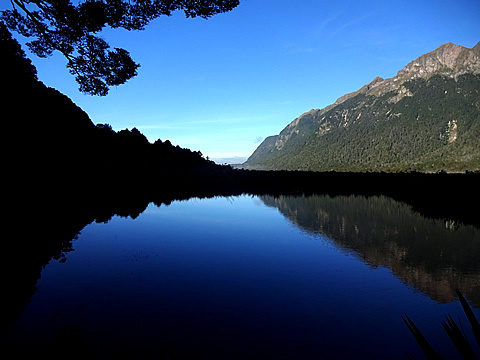 The drive from Te Anau to Milford Sound is truly spectacular. 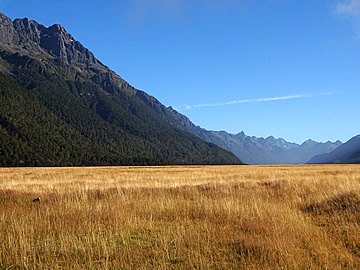 We drove it once on the way to the cruise, and the following day as far as the Divide for a walk to Key Summit. 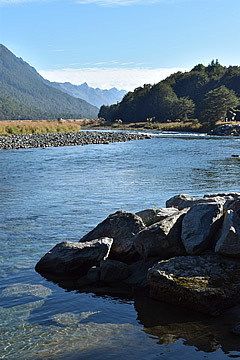 South of the Homer Tunnel the road roughly follows the course of the Eglinton River upstream as it winds its way down from the mountains to Lake Te Anau, before climbing up to the tunnel entrance. 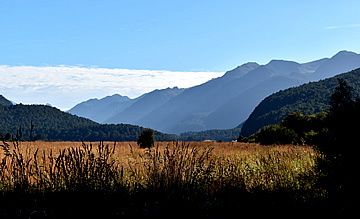 We stopped to take photographs at various spots on both days, having to keep an eye on the time on the cruise day so we wouldn't be late! 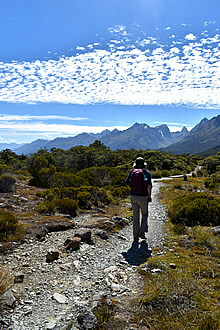 The weather was unbelievable both days: hot and sunny and clear - we could see for miles! 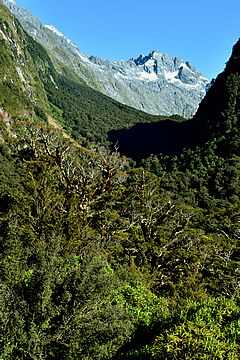 Rank upon rank of majestic mountains, tree-clad on the lower slopes rising to steep rocky peaks. 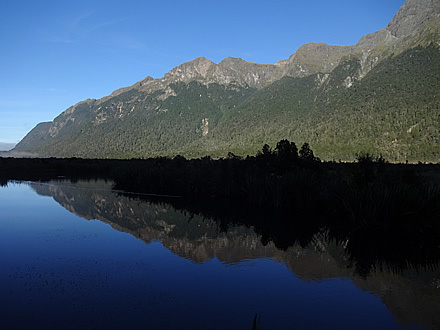 Clear blue expanses of water holding perfect reflections. 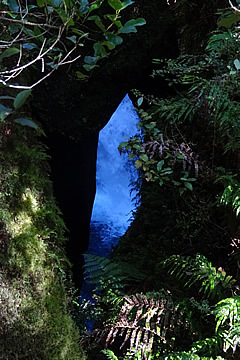 Tumbling rivers, forcing through steep gorges. 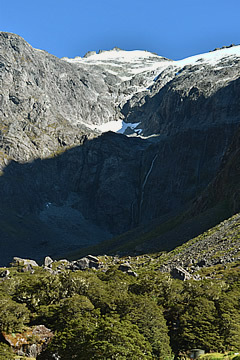 View from the road approaching the Homer Tunnel. 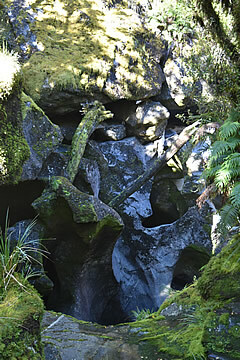 We saw keas on the east side of the tunnel - they have very dark plumage. 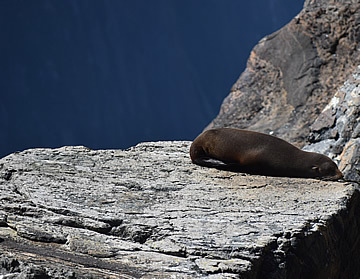 Drivers are warned to watch out for them as they have a penchant for pulling aerials or chewing on rubber such as windscreen wipers! 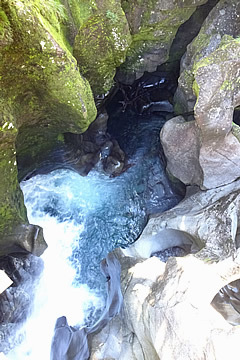 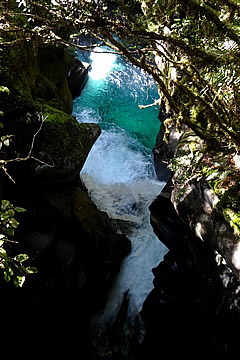 Our final stop before heading to the Sound was to do a short walk to the Chasm. 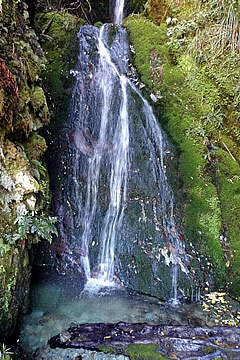 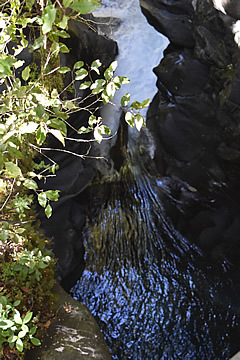 A series of narrow waterfalls plunges down between steep cliff walls in a rocky forest landscape. 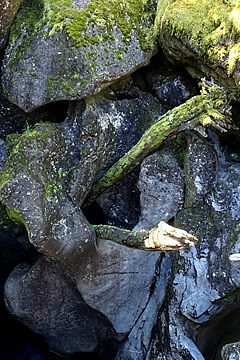 There were quite a number of tree trunks caught in the rocks. 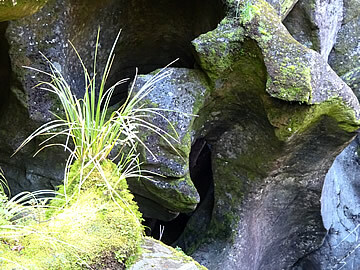 Some weird and wonderful rock formations at the Chasm. 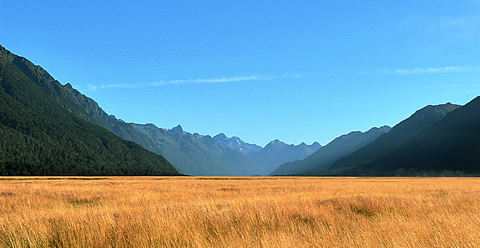 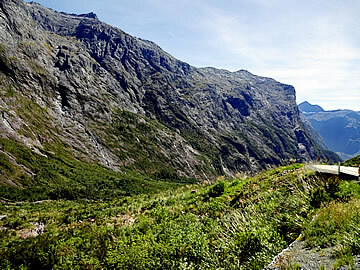 North west of the Homer Tunnel; 20kms from here, descending 945m, the road reaches Milford Sound. 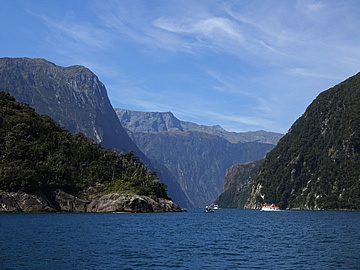 We arrived and parked in good time for our cruise on Milford Sound, plenty of time to have a quick lunch of very good pies in the café there. 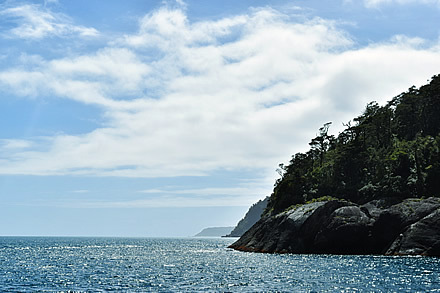 We had seen a couple of dolphins in the bay as we walked around but they'd gone after lunch - too far away for decent photographs. 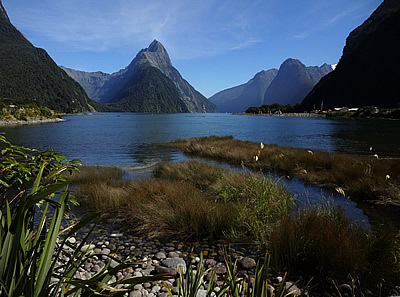 The view of the Sound from the foreshore was stunning with Mitre Peak at the entrance looking very impressive. 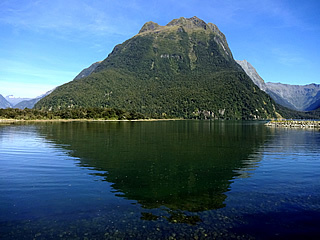 Mitre Peak, at 1692m, is the highest mountain here. 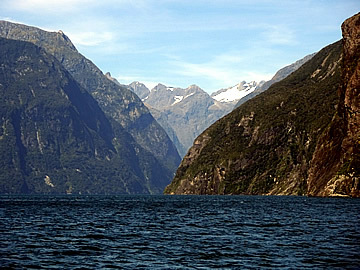 Entrance to Milford Sound from the east. 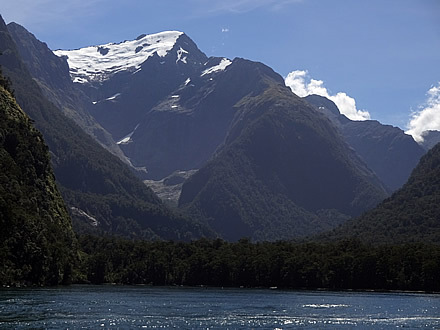 When Captain James Cook sailed north past the fiords in March 1770 the weather was far too bad to allow his ship Endeavour to enter any of them - they might get in but with strong south-westerly and westerly winds blowing, how would they ever get out again? 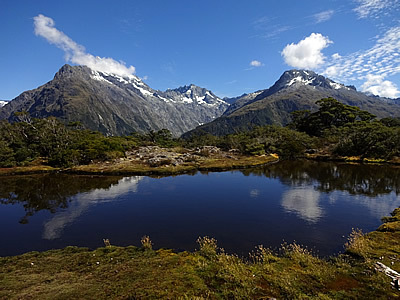 On his second expedition the weather was more favourable and he was able to anchor Resolution in Dusky Sound on the south west tip of the South Island in March 1773. 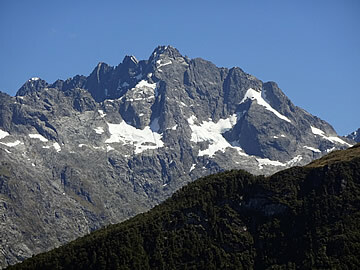 Centre is Lion Rock and the snowy peak behind is Mount Pembroke. 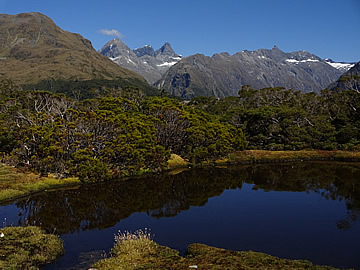 Cook and his crew had been sailing in Antarctic waters and so the spectacular bay with its sunlit mountains, waterfalls and streams, wooded foreshore and abundance of fish and bird life was like a paradise.2 A New Zealander, Beaglehole, who was on the Resolution described it as "one of the most remote and wildly magnificent spots in New Zealand" (quoted by Houghton in "Captain James Cook: a biography"2 - an excellent biography of Captain Cook, highly readable). 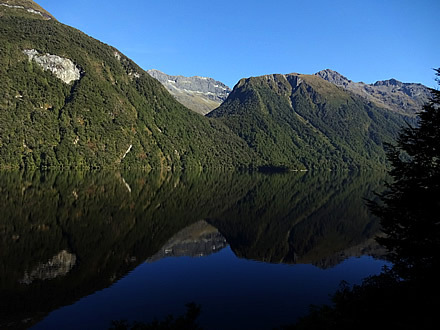 We had loved the remoteness and peace of Doubtful Sound - Dusky Sound appears to be just as spectacular, but I'm not sure it's possible to get there! 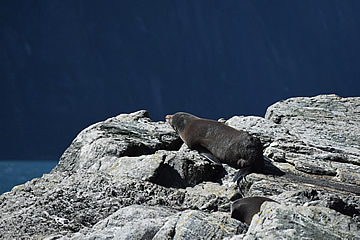 A number of seals were doing absolutely nothing but snooze on this sun-drenched rock, surrounded by dramatic scenery. 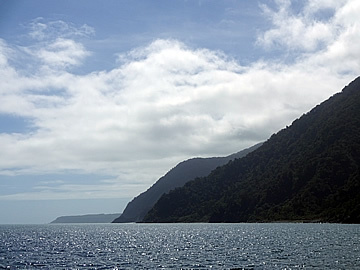 Into the Tasman Sea - a coastline that was familiar to Captain James Cook almost 250 years ago. 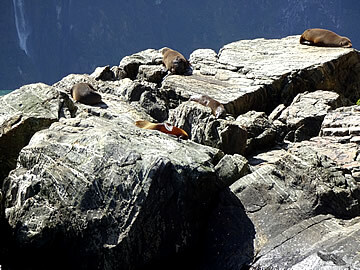 As in Doubtful Sound we came across a colony of seals basking in the sun on a rocky outcrop. 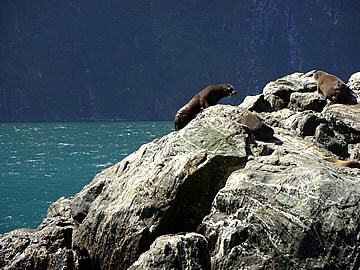 Fairly harmless, though I'm not terrifically fond of them - at Walvis Bay in Namibia we'd visited a huge colony on the seashore, they made a lot of noise and stank! 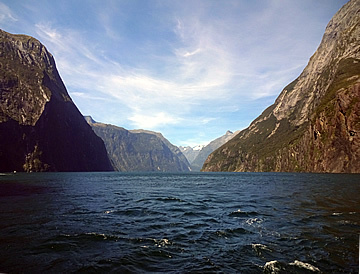 We travelled the length of the Sound into the Tasman Sea. 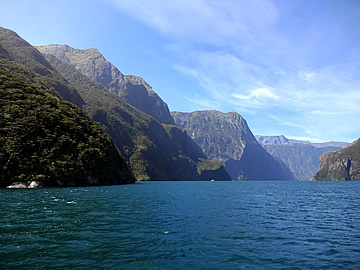 It was a very calm day and the sea was not as rough as we'd had it at Doubtful Sound. 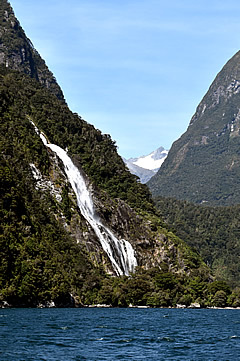 162m Lady Bowen Falls - the highest waterfall on Milford Sound. 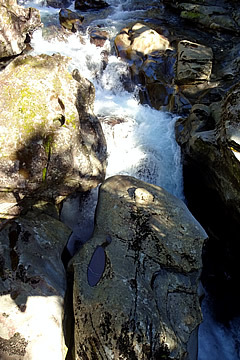 We were blessed with beautiful weather, but this did mean that the waterfalls were not at their most powerful - only one or two were worthy of the name. 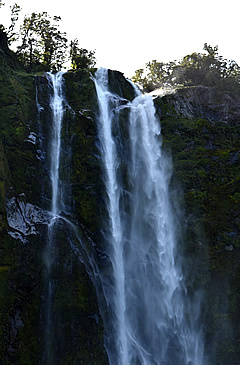 So if you take the trip and the weather is wet, at least there is the compensation of spectacular waterfalls! 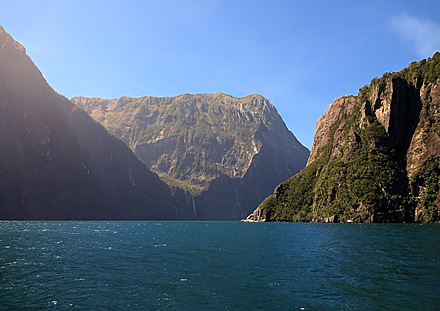 We had now cruised both Milford Sound and Doubtful Sound and whereas both are stunningly beautiful, with ranks of dramatic mountains plunging steeply into the water, the feel of the fiords is quite different. 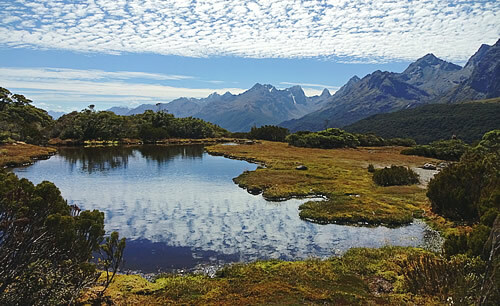 Milford's mountains are higher, though Doubtful's are still impressive; Doubtful has a more wilderness feel, plus three side arms to explore. 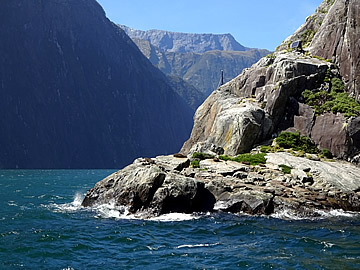 For us Doubtful Sound just has the edge for its remoteness and solitude. 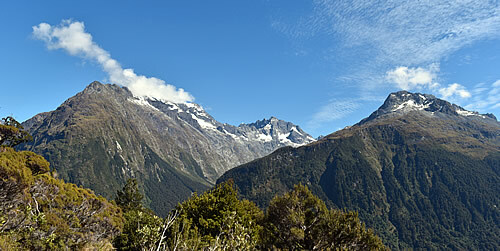 The Doubtful region is much more inaccessible than Milford. 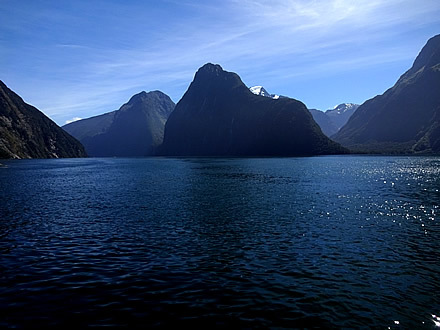 At Milford many boats wait at the dock and there is always at least one other boat, usually more, in sight on the fiord. 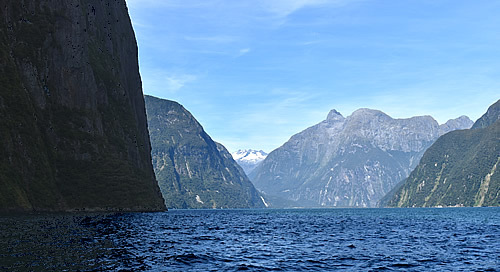 On Doubtful Sound we were the only boat there, at one point experiencing complete and utter silence as the captain turned off the engines in one of the spectacular side arms of the fiord. 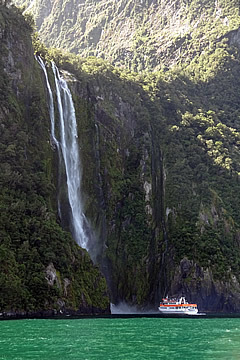 We felt that, on Doubtful Sound, we had experienced New Zealand's fiord wilderness in a way not possible at Milford. 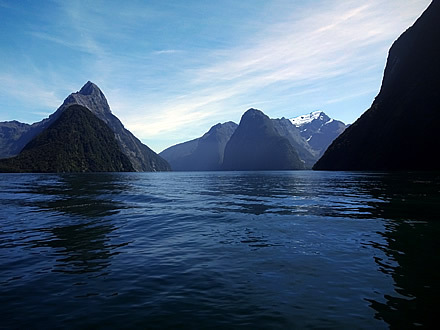 But both Sounds are unbelievably beautiful, and we returned to harbour with more wonderful memories of breathtaking New Zealand. 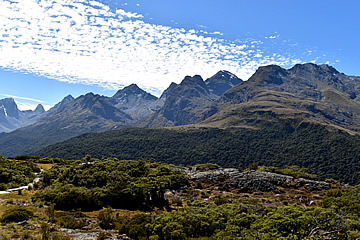 The day after our Milford Sound cruise we returned along the Te Anau-Milford road and stopped at The Divide to do the Key Summit hike - or tramp as it is called in New Zealand. 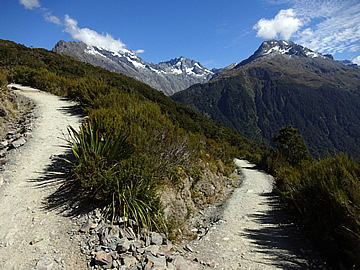 It is a steady climb at the start of the Routeburn Track for about an hour, then branching off for a steeper ascent to Key Summit, quite tough if you're not reasonably fit. 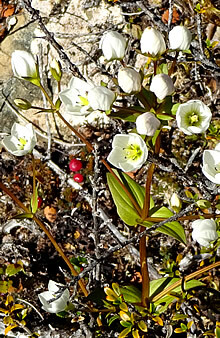 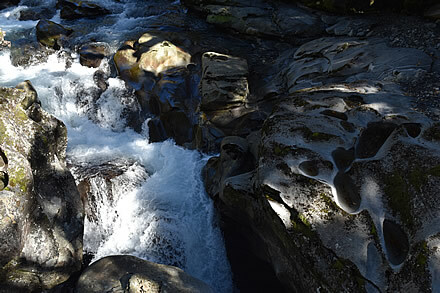 We had no problems, especially as we made numerous stops along the way to take photographs of the stunning scenery. 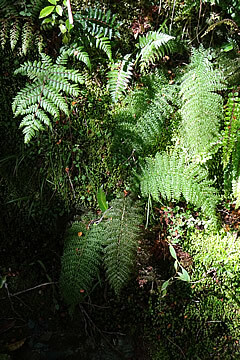 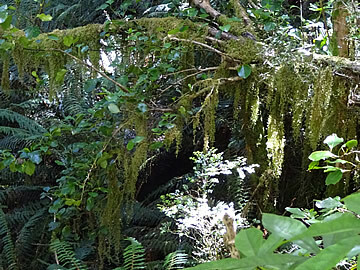 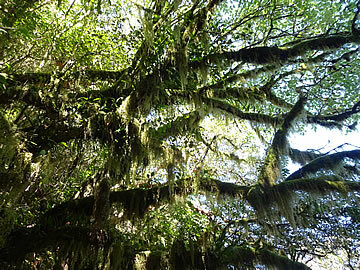 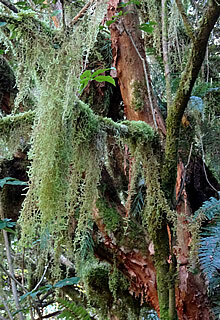 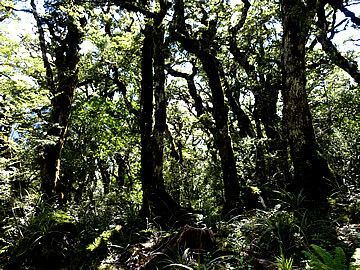 The walk begins through beech forest with an abundance of ferns, moss-covered trees dripping with lichens, and birds flitting in and out - we saw a beautiful fantail. 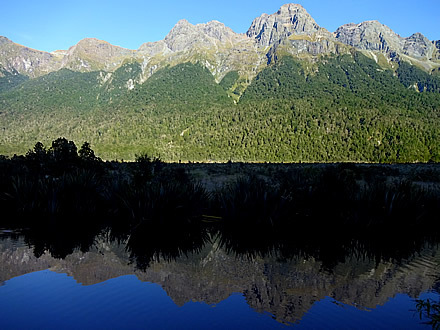 The views quickly appear and just keep getting better. 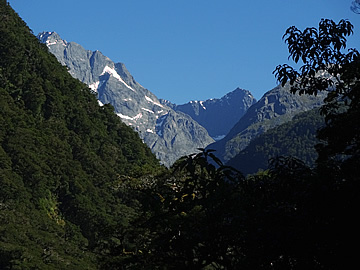 The views down the Hollyford Valley are stupendous. 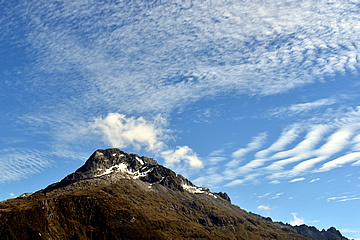 It took us about an hour and a half to climb to the top, well worth it for the breathtaking panorama of mountains. 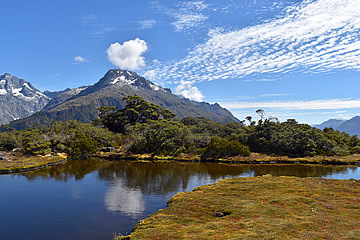 There are beautiful tarns on the summit and very little shade - we had a picnic lunch in the only bit we could find! 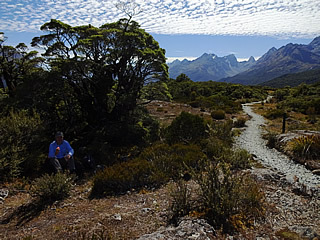 It was another really hot day so sun block, hats and long sleeves were essential. 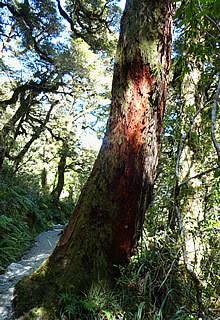 After lunch we explored the summit before descent, the views still spectacular, back into the cool forest. 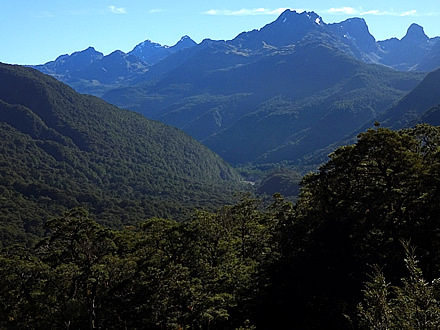 "Captain James Cook: a biography", Richard Hough, Hodder & Stoughton, 1994.